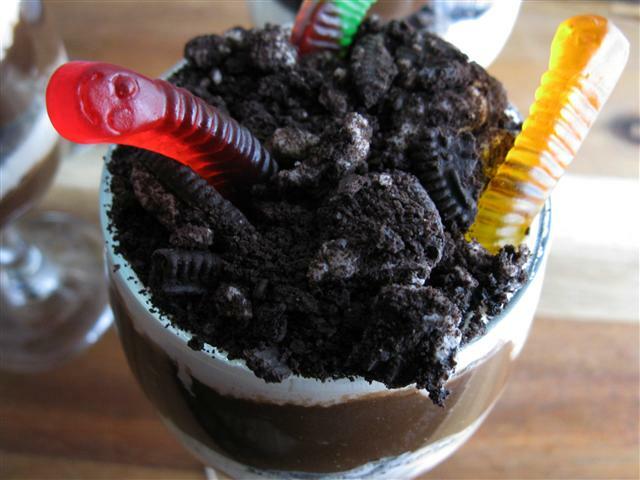 Mud pie pudding with gummy worms is one of the favorite dishes of kids as they get a good chance to spend some recreational time in the kitchen. Moreover, it is very easy to make as it doesn’t require any cooking as compared to other dishes. Take a large bowl and pour some milk in it. Then, add the instant pudding in the milk and whisk it thoroughly. You have to mix milk with pudding until the granules are completely dissolved. Now, allow the pudding to settle down. Generally, the pudding takes around five minutes to set in the refrigerator. After that, you have to crush the chocolate sandwich cookies (e.g. you can take Oreos) in the gallon plastic bag. Make sure that the bag is properly closed before crushing the cookies. Stop crushing the cookies when they turn into small chunks. It is not necessary that all the pieces must be crushed into equal sizes. Then, place the crushed cookies into the pie pan and press them down very lightly. Now, put half of the chocolate pudding right over the crushed cookies with the help of a spoon. Then, add some gummy worms to create the effect of worm lairs under the dirt. After that, place the whole pudding mix into the pie pan and then add the remaining gummy worms on the top. Dot the mud pie with the help of whipped cream piles. Make sure that you place the whipped cream in the right way, otherwise it will spill all over the pudding. In order to represent the ants on the pudding, you will have to dribble the black sprinkles on the whipped cream. Serve the pudding after the lunch or supper and enjoy.